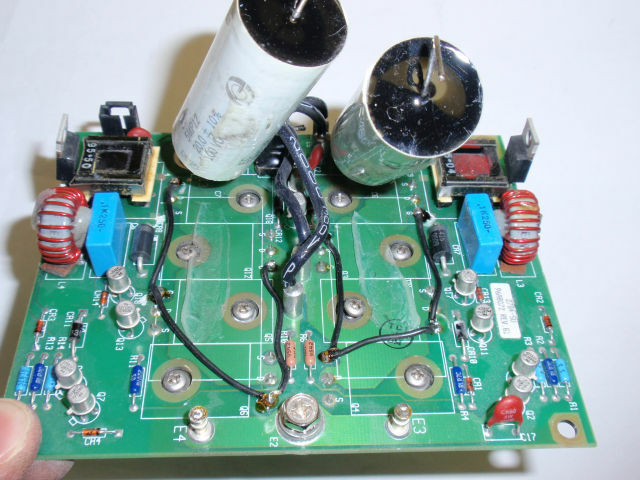 Sometimes you need a low voltage power supply of very high currents (hundreds of amperes) - whether for spot welding, heating or melting metals, starting the vehicle engine, or other physical experiments. Such a supply I have now decided to build. Given that I already have a switching power supply 3-60V 40A and 60A 56V power supply, so I desided to build a switching inverter that which will change the DC voltage of up to 60V to a smaller voltage to approximately 12V at a higher current. I chose the topology of push-pull that uses a transformer with 5:1 ratio. Voltage regulation (if necessary) and current limit are provided by a source of input voltage. This switching inverter reduces the input voltage of approximately 5:1 ratio minus the lossed and voltage drops (diodes, MOSFETs, winding and conductors resistance), in practice it is up to 6:1. In almost the same rate, thw inverted increases the allowable current. For 40A input source you can get about 200 - 240A. The highest output voltage of this high current switching inverter is about 10-12V. The schematic diagram of the described switching inverter is shown below. Transformer Tr1 has primaries 5+5 turns and secondaries 1+1 turn. Switching is provided by 4 + 4 MOSFETs. 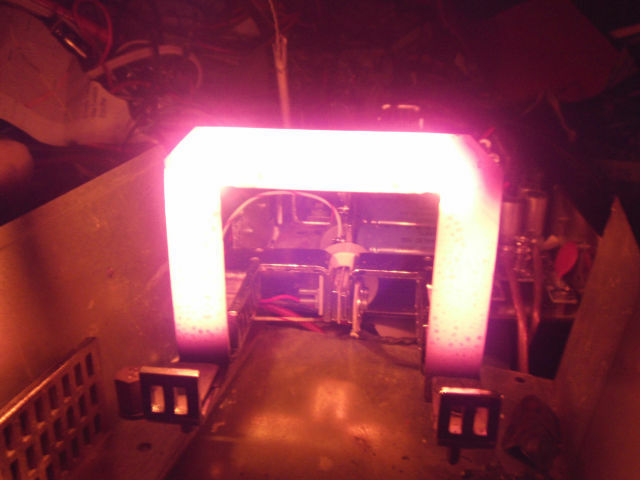 I used IXFH50N20 type (50A, 200V, 45mR, Cg = 4400pF). You can use any voltage MOSFETs with Uds 200V (150V) and the least conductive resistance. The speed and smaller capacity (charge) of gate are also not bad. 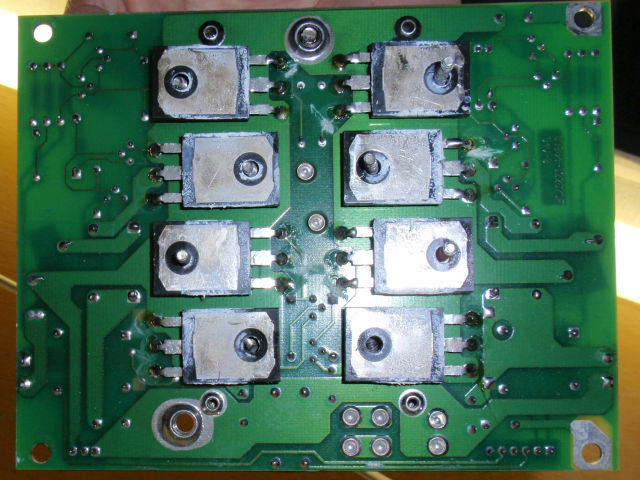 Secondary rectification is provided by two double Schottky diodes MBRP60035CTL (600A, 35V). Ferrite transformer Tr1 has the cross section about 15 x 15 mm. Inductor L1 is formed by 5 iron powder rings threaded on wires. 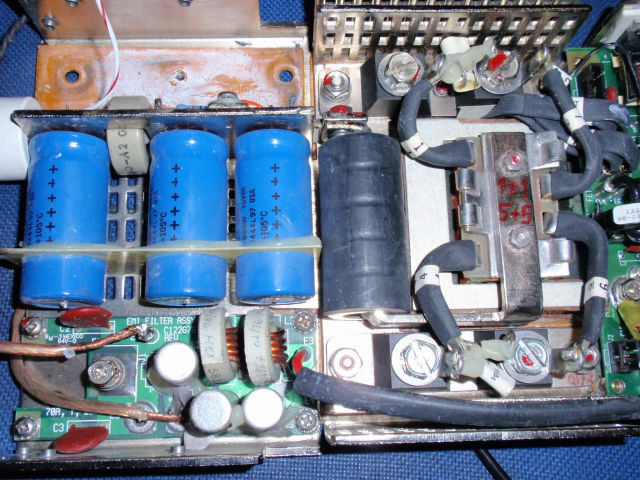 Inductance, radiator and some other parts I got from some old inverter 56V / 5V (hundreds of A), that was used for information technology. I used the original snubbers on the power board. I disconnected the gates from the original circuit (unusable) and hooked to my own control circuit. It uses an integrated circuit IR2153. Due to the large capacity of gates (4x 4n4), I had to use a power amplifier with a pair of NPN / PNP transistors BD139 and BD140. However, the IR2153 circuit can be replaced by other control circuit allows pulse width modulation (PWM), for example, SG3525, to create a regulated source. It is theoretically possible to change the input voltage (other MOSFETs, primaries, etc.) 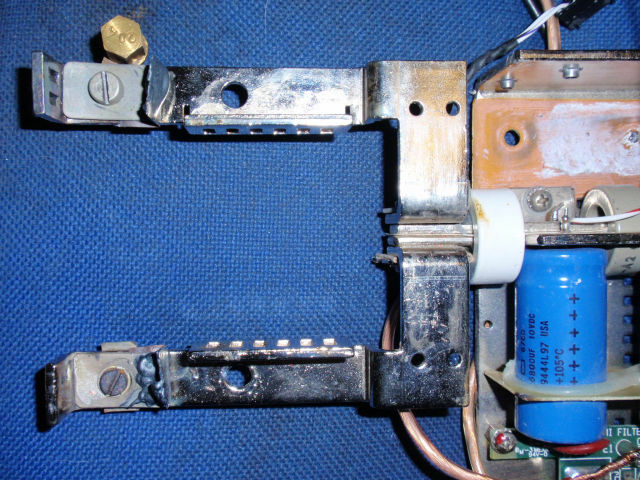 and even work directly with a rectified mains. 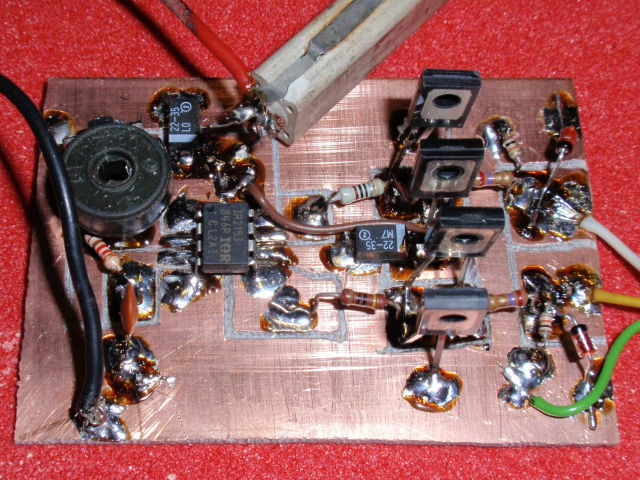 This switching supply topology provides galvanic isolation. 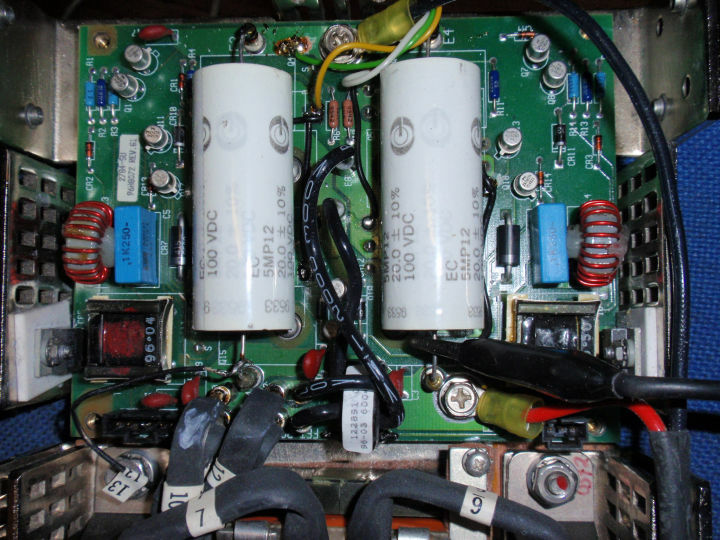 Warning - MOSFETs sees twice the input voltage (at 60V it is 120V and in case of rectified 230V~ mains it would be 650V). Operating frequency is about 40kHz. In the short term use (eg as a vehicle engine starting source, spot welder) are not so great demands on the cooling, winding sizing, etc. In continuous operation, good cooling is necessary. Greatest power loss occurs at the output diodes. Schottky voltage drop is about 0.5 V and a current for example 240A gives its loss of 120W. Warning! These experiments can cause burns, fire or property damage! Everything you do on your own risk. 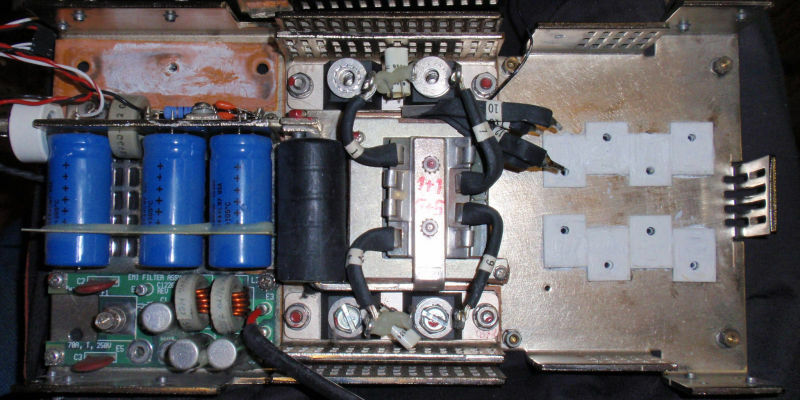 The original board, only power components are used. Gates are cut off and attached to the new driver. Copper heat sink, capacitors and inductances. ... and after the mounting of board with MOSFETs and snubber elements. The output electrodes for experiments with metal melting. When used as a vehicle engine starting source, cables are connected. The supply heats the iron sheet to white. 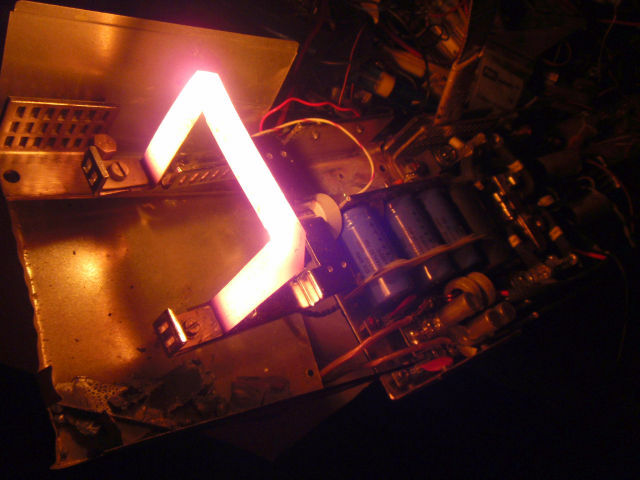 Source heats iron rod of 6mm diameter to white glow. 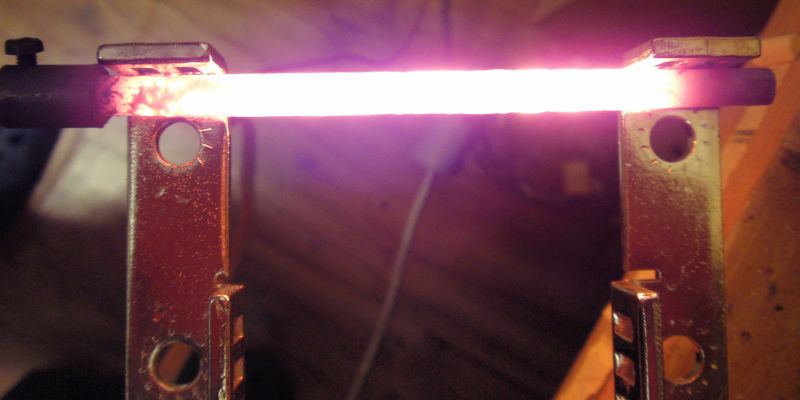 Video - Source heats iron rod of 6mm diameter to white glow. Video - Wire at the output. Video - Iron sheet once more.